Alimentary mucositis is a significant complication of cancer therapy, with important clinical and economic implications. 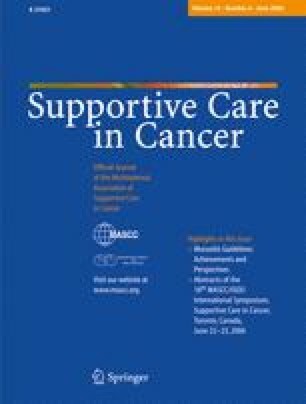 In June 2005, the Mucositis Study Group of the Multinational Association of Supportive Care in Cancer/International Society for Oral Oncology conducted an evidence-based review of the literature on alimentary mucositis. The goal of this literature review was to update previously published guidelines for the management of mucositis. This article reports the findings of the subgroup charged with reviewing the literature related to anti-inflammatory interventions. Considerable preclinical and clinical evidence suggests that the use of anti-inflammatory agents may be a promising approach to reduce the severity of mucositis. However, there was not enough evidence to support any new guidelines advocating the use of any specific anti-inflammatory intervention. Thus, there is a need for well-designed clinical trials evaluating the use of anti-inflammatory agents in the management of mucositis. The authors thank Mr. Ronald D. Hutchins, University of Texas MD Anderson Cancer Center, for conducting the literature search.